As I remarked some days ago on my Facebook page, the presence of pet dogs in the Falkland Islands is a recent phenomenon – from living here in 1986-7, I can only recall a single Stanley resident who kept a lapdog in his house. Dogs were working animals on sheep farms and, if they couldn’t handle the job, they had no value to farmers and were often just killed (now, fortunately, many townies adopt the surplus dogs). Cats, on the other hand, were abundant and many Islanders still have multiple felines in the house, though some farms have eliminated them because they threaten the wildlife, particularly smaller birds. 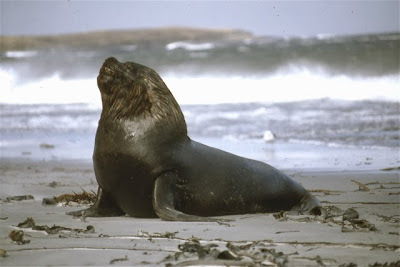 As the photograph above suggests, dogs are gaining ground, but Islanders have often had somewhat unconventional pets. Many Stanley households, for instance, kept a pet lamb (which of course became a full-grown sheep) in lieu of mowing the lawns outside their houses, and eating that lamb was unthinkable. One, I recall, sardonically named his pet “Dinner,” but nobody would have dreamed of eating such an animal. 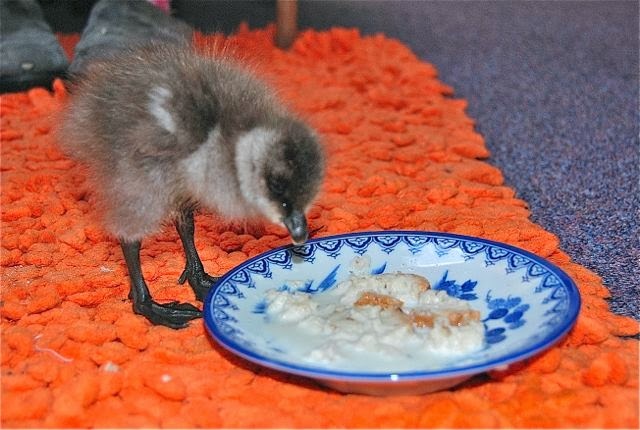 At the same time, Islanders sometimes acquire even more unconventional pets. When I was last here three years ago, my friend Nancy Poole had adopted an orphaned Upland gosling from someone who had found it wandering in the countryside, and she nursed it to adulthood by feeding it milk-laden bread until such time as “Deuce” (as she christened the bird) could fend for himself on the grass in their yard. 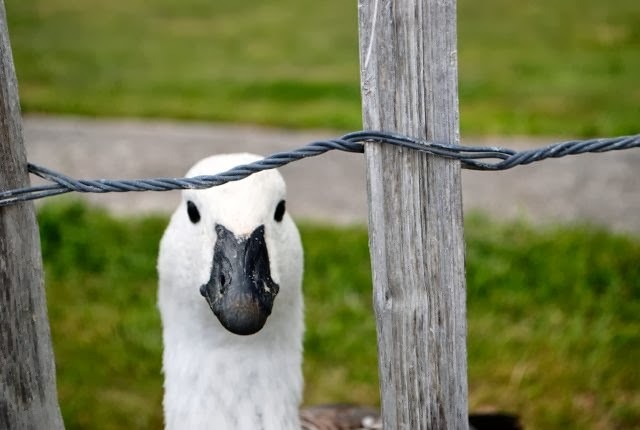 For many years, sheep farmers considered the Upland Goose a pest that devoured pasture rightfully destined for their lambs and ewes, and for a time local government even paid a bounty for goose beaks. When I first met Deuce, he was the cute little bird who appears in the photograph above, but in the interim he’s become something else entirely. As his intense gaze suggests, if I or anyone else other than Nancy approaches his enclosure, he resembles an angry Rottweiler – several times he’s charged me and, though there’s a fence between us, he’s even managed to grab my jeans with his beak. If he were loose – his wings are clipped – he would have no compunction about continuing his attack. My malamute, unfortunately, once bit our postman in California, but in Stanley I worry more about Deuce attacks. 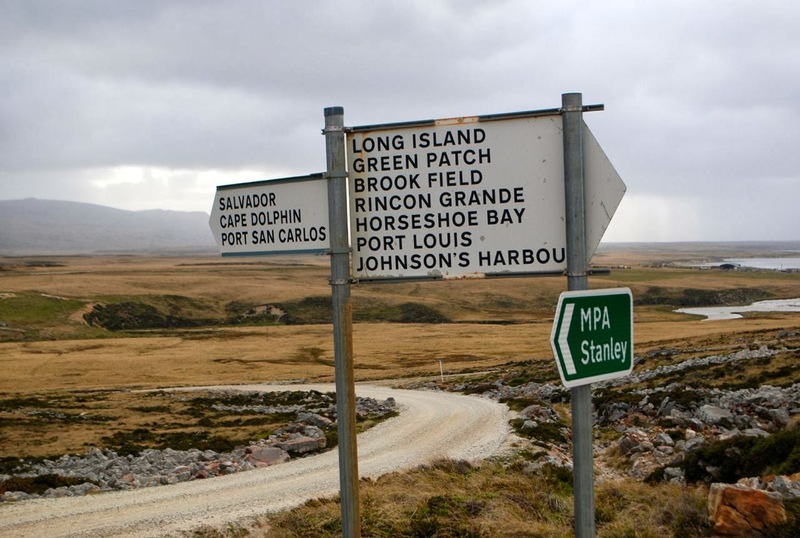 From the mid-19th century, it was customary for every arriving Falklands visitor to call at Government House, the imposing building on Stanley’s Ross Road West, and sign the register. 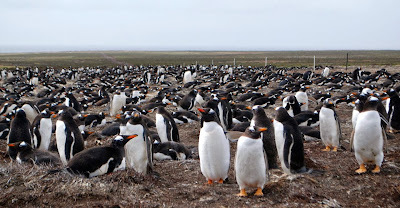 By the time I first arrived in the Islands, in early 1986, that custom had disappeared in the aftermath of 1982's South Atlantic war, as increased political and economic activity brought many more new people here, and the practice became impractical. Succeeding governors, also, were publicly less gregarious than their predecessor Rex Hunt, who genuinely enjoyed socializing with the Islands’ population. 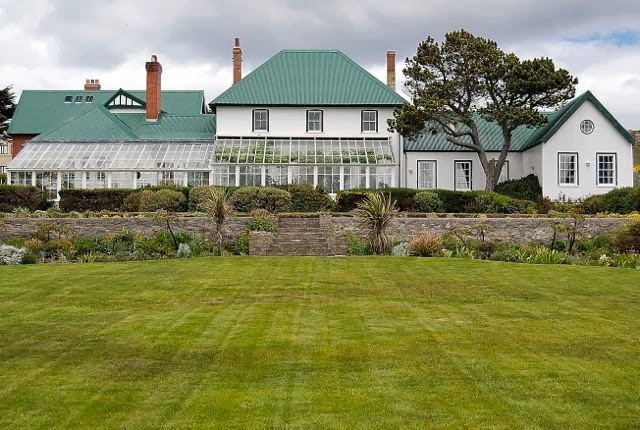 One Government House feature that always fascinated me was the large conservatory (greenhouse) that stretches across two-third of the building’s northern exposure. It includes one of the world’s southernmost grapevines, a “Black Hamburg” variety that, I am told, produces abundant fruit. It is certainly one of the world’s southernmost grapevines; to the best of my knowledge, the only more southerly one sprawls through the conservatory restaurant at the Hotel José Nogueira in the Chilean city of Punta Arenas. Nobody, though, has ever been able to identify the variety to me. Yesterday, though, I finally got a chance to visit Government House – or at least the conservatory - in the company of head gardener Jeremy Poncet. I had previously met Jeremy in Stanley Harbour when he was an infant aboard the Damien II, a research yacht that his father Jerome and mother Sally regularly sailed to South Georgia and Antarctica (Jeremy’s brother Dion was born in South Georgia, aboard the vessel). This is a seafaring family, but Sally put me in contact land-based Jeremy, who oversees ornamental plants, fruit trees and vegetable gardens both outdoors and in greenhouses. 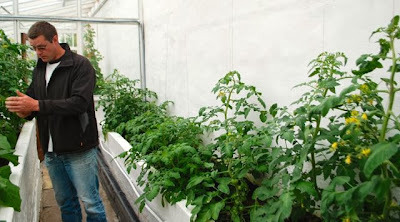 As the photograph above shows, this season’s tomato plants are flourishing, though he wonders whether ultraviolet radiation through the Ozone Hole over southernmost South America might be causing mutations in the foliage. In reality, the Government House gardens produce more fruit and vegetables than the governor and his staff can officially consume, with the surplus going to island schools and for charity purposes. 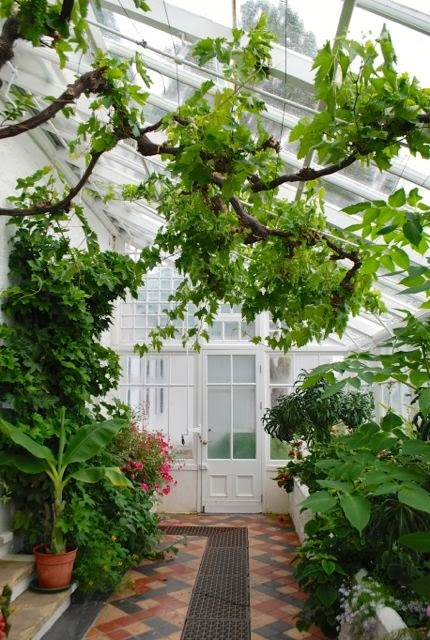 That includes the fruit of the prodigiously productively grapevine, seen here from inside the conservatory in the early stages of its springtime growth. Jeremy has pruned it and other exotic plants judiciously. While Government House and its gardens are not a tourist sight as such, Jeremy is willing to conduct tours for visitors with an interest in cultivated plants in this challenging environment (today, even as summer approaches, we saw a hailstorm and even a few snowflakes). He can’t handle cruise ship crowds, but is happy to accommodate individuals and very small groups, his other duties permitting. Saturday afternoon, after a delayed arrival at the Falklands, I enjoyed a home-cooked dinner of Patagonian toothfish (“Chilean sea bass”) before a relatively early to bed – in a single night, I managed to pay the enormous sleep debt that had accumulated due to five hours of jet lag (from California) and three days of appointments (in Santiago). 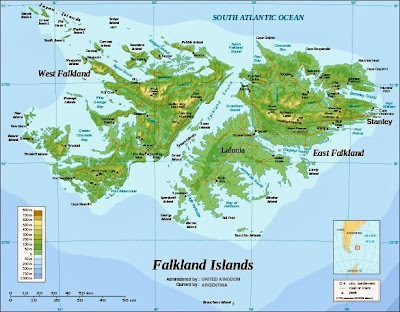 Sunday morning I felt refreshed and, when my host Ray Poole asked if I might be up for an excursion, I impulsively suggested Cape Dolphin, East Falkland’s northwestern peninsula that I never seen in my previous stays (see map above). Ray and his wife Nancy accepted my suggestion enthusiastically, and packed a picnic lunch on a sunny morning that – unusually for the Falklands – was utterly windless. We drove their Land Rover out the Mount Pleasant Airport road for a few miles before turning onto the San Carlos Road. It took two hours to cover the 60 miles to Cape Dolphin Farm, but another hour to manage the ten miles to the tip of the peninsula, covered by dense tussac grass (Paridiochloa flabellata). 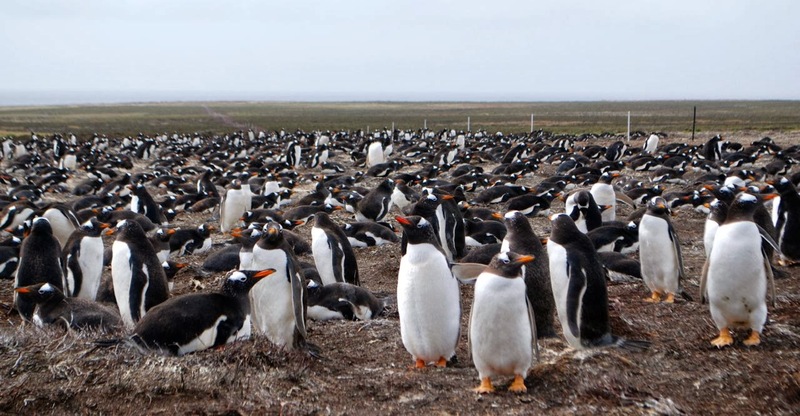 En route, we stopped to observe a colony of perhaps 400 Gentoo penguins, in the early stages of their nesting season. At one point, though, the tussac grew too dense for the Rover to advance any farther, and we parked to enjoy sandwiches before Ray and I continued toward the tip of the peninsula. 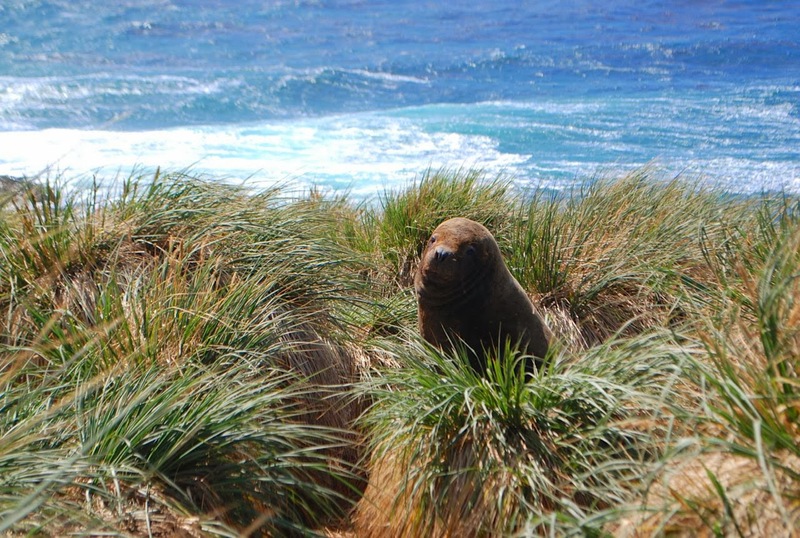 Nancy chose to stay back for concern about the southern sea lions (Otaria flavescens) that inhabit the tussac. As the photograph below shows, the males are imposing beasts, weighing up 750 pounds (350 kg), and can be aggressive. Fortunately, they’re not quite so quick on the ground as their African namesakes, even though their manes evoke some resemblance. 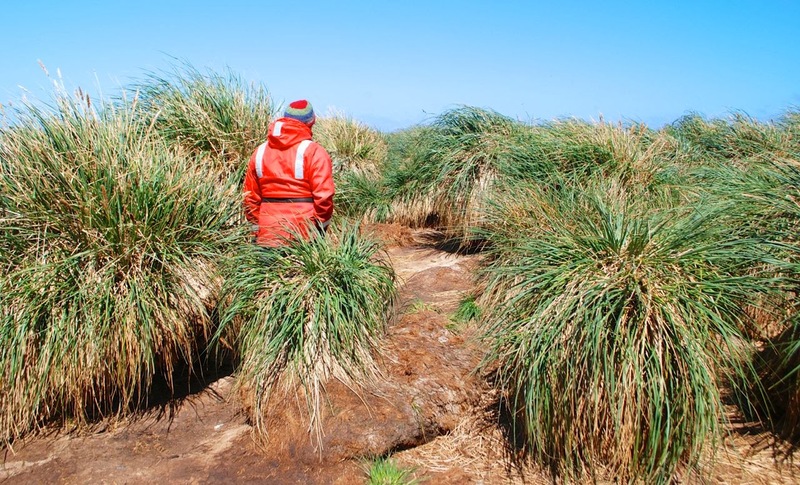 Ray scouted the route ahead, occasionally climbing atop a dead tussac mound, but on one occasion he inadvertently startled a large male and briefly lost his shoes before the beast retreated. I followed and, for my part, I’m cautious walking through tussac bogs; in the end, we saw dozens of lions before returning safely to the vehicle. 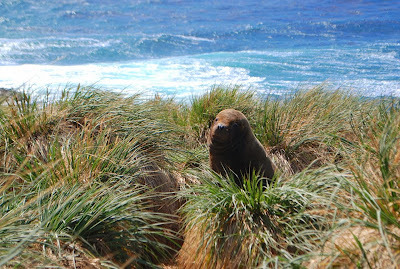 Most of the sleeping lions didn’t even see us but, when they did, they scampered away toward towards the beach below. I don’t know of any actual attacks on hikers here, but it’s an exhilarating experience to walk among them. It made for an auspicious start to what will be an unfortunately short week in the Islands, before I return to Chile on Saturday. It’s been a busy couple days in Santiago, as I adapt to five hours of jet lag, but I’ve made a number of interesting discoveries. Here are a few of them. Yesterday, in the Navimag offices at Las Condes, I learned the identity of the new vessel that will cover the classic route from Puerto Montt to Puerto Natales in February (or perhaps a bit earlier). Acquired from Baja Ferries, where it covered the route between La Paz (Baja California Sur) and the Mexican mainland, and rechristened as M/N Edén, the new vessel will accommodate only about 100 passengers as compared with Navimag’s previous vessel Evangelistas, which had a capacity of some 250. All passengers will pay about US$500 for the three-day trip, leaving every Friday from Puerto Montt and returning from Natales on Tuesday, but anyone who wants greater privacy will be able to buy out the whole of a four-bunk cabin. 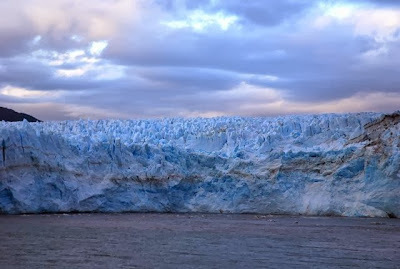 There will be other changes in services as well – the new ship will not detour to see the Pío XI glacier (pictured above), for instance – but I won’t appreciate all the details until I’m able to take the trip later this summer, hopefully. Still, given that this is a high-demand route, make your plans early. It was such a busy day that I skipped lunch but, when I finished with all my appointments and office visits, it was not even 6 p.m. – far too early for dinner here, even though Chileans dine a bit earlier than Argentines. Nevertheless, I made my way to Barrio Lastarria and stumbled upon Bocanáriz, a new wine bar that opened just after my last visit, a bit more than a year ago. 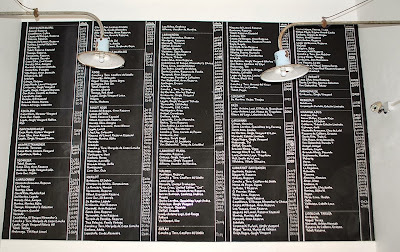 Wine bars are too few in Santiago, but Bocanáriz looks ready to remedy that, with an impressive listing of exclusively Chilean vintages from throughout the country (as the wall display suggests), including an ample selection by the glass and in flights. 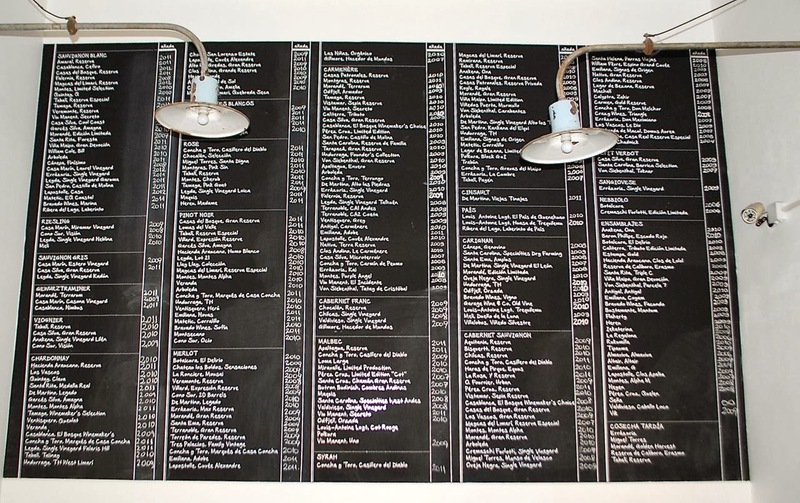 They also have a bar menu, which made it ideal for me at that hour. 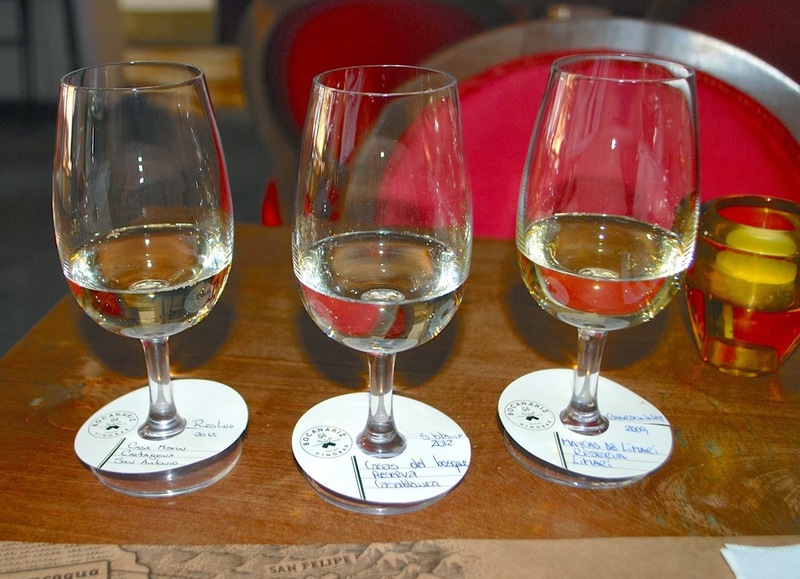 On a warm spring afternoon, avoiding the temptation to overeat, I chose a plate of ceviche – comprised of the mild white reineta (bream) plus avocado and cucumber – along with a flight of Chilean whites. 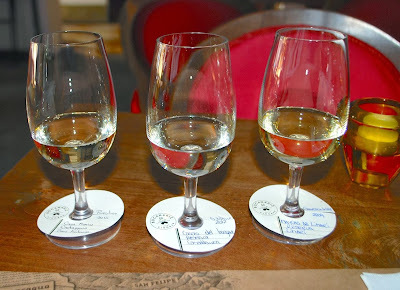 It started with a Casa Marín 2012 Riesling, followed by a Casas del Bosque 2012 Sauvignon Blanc (my favorite of the three) and Maycas de Limarí reserve Chardonnay from 2009. Satisfying both my hunger and thirst, it was an auspicious introduction to a place I plan to return. 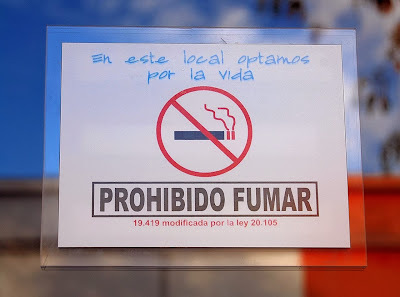 Earlier this year, I might conceivably have avoided Bocanáriz but, in the interim, Chile’s new tobacco control law has made all bars and restaurants smoke-free – except on sidewalk seating, where the air quality can still be toxic. Another pleasant surprise, on boarding the Santiago Metro for the first time on this trip, was to enter an air-conditioned car on a system that, in the past, has sometimes been suffocatingly hot. It’s still crowded, and not all cars have a/c, but the trend is clearly in that direction. 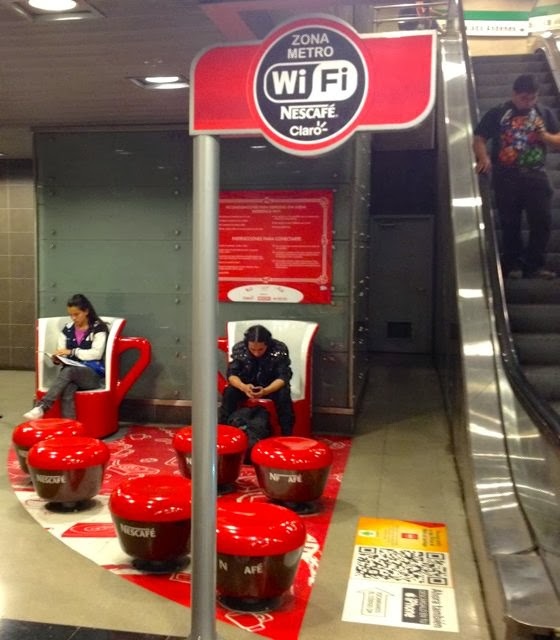 I’ve never quite understood why the Metro provides free WiFi, given how short wait times are, but it does continue to provide sit-down space for computer and smartphone users. That said, it’s not user-friendly for foreign visitors, as signing in requires using your Rol Único Tributario (RUT, the Chilean government’s tax ID). Privacy issues aside, few visiting foreigners will have one (I do, but don’t know it by memory to be able to sign in without checking my papers). It’s only a few days until I fly south – Monday the 18th in fact – and, as usual, that’s a busy time, with lots of loose ends to tie up before I spend more than four months in the Southern Cone countries while updating Moon Handbooks Patagonia and my apps to Argentina and Chile (see the right hand column for links). 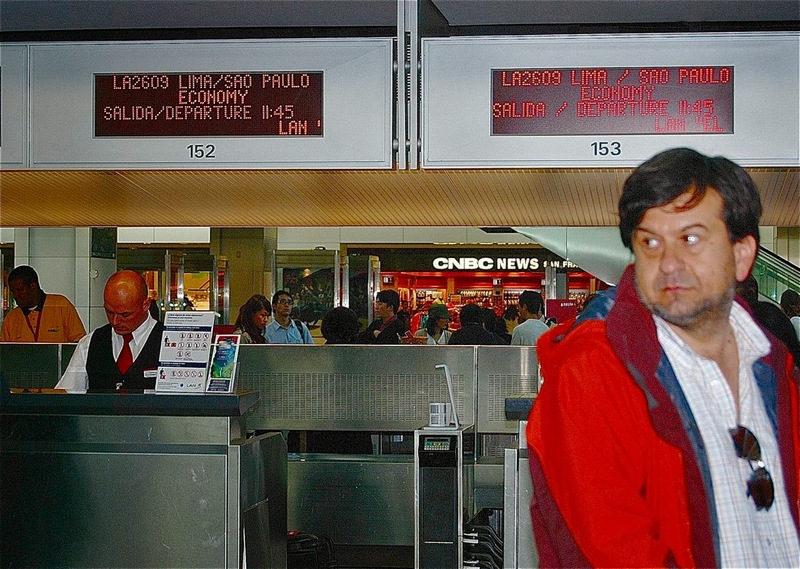 It’s a long flight from San Francisco to Lima, where I change planes for Santiago, and yesterday I learned, to my dismay, that LAN’s SFO-Lima route will end next spring. My March 29 flight back from SCL via Lima may be the last on this route. Apparently, it’s not that the route was unsuccessful – according to a travel agent friend who discussed the issue with LAN, “the flights are full but they’re not profitable because they’re not daily, and they will add flights from Los Angeles and Miami.” It’s still a little unclear, to me at least, whether LAN was unable to schedule more flights because of some glitch at Lima or SFO (whose LAN counter appears in the photograph above). It will be missed, especially since LAN's service is so superior to American, the next easiest connection to Santiago. 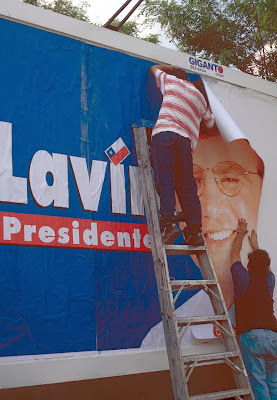 My Tuesday arrival will take place after Sunday’s Chilean elections. I’ve been through a Chilean presidential campaign before, when Ricardo Lagos bested Joaquín Lavín in a 2002 runoff, but Sunday may not require a runoff – the conservative UDI candidate Evelyn Matthei’s inept campaign is making Mitt Romney’s 2012 effort look smoothly professional by comparison, and most observers expect former president Michelle Bachelet to win easily. If Bachelet fails to win a majority, though, there will be a runoff December 15th (though Matthei might not even make the runoff). I’m disappointed to miss the election, but there’s at least one thing I’m looking forward to, and that’s clean air – earlier this year, Chile finally banned smoking in restaurants, bars and other indoor spaces, so that I can now go to any restaurant in Santiago or elsewhere without being subjected to second-hand smoke. Many restaurateurs objected to the measure but I expect, as in other countries, they will find that their business returns after a brief lag and, in fact, may even increase. 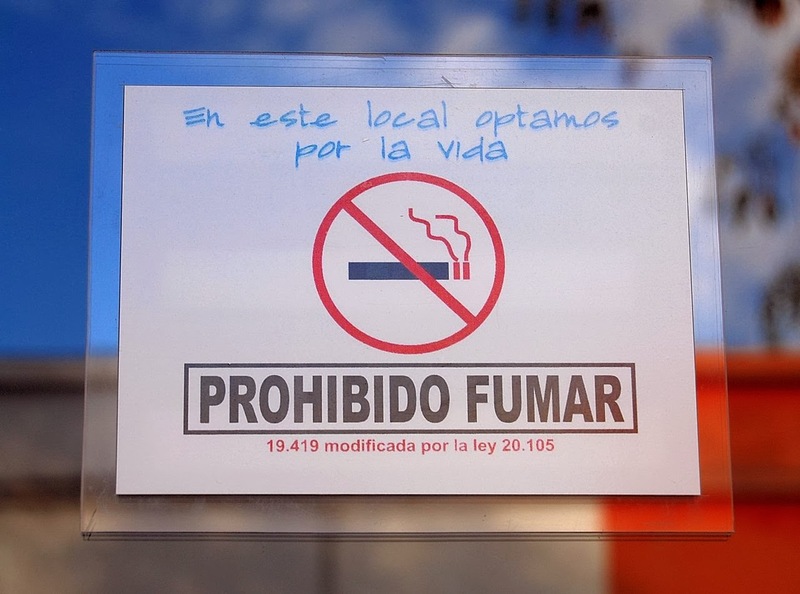 The photograph above, from Santiago’s Barrio Bellavista, comes from a far-sighted restaurant that decided years ago on the tobacco-free option. This, of course, means a lot of busy work updating my Patagonia book (a few places in Argentine Patagonia have new area codes as well) when I’d rather be hiking in the Andes or rafting down the Futaleufú. I’ll have just a few days in Santiago, though, before I fly to the Falkland Islands for a week – my first visit in three years, and one I’m looking forward to with great pleasure. I first visited Peru in 1979 and, except for brief layovers at Lima’s Aeropuerto Internacional Jorge Chávez, I haven’t visited the country for nearly 30 years. At the time of that early visit, on a backpacker budget, I survived mostly on roasted chicken, which is indeed a Peruvian specialty – in fact, one recently closed restaurant in Berkeley specialized in the dish. Unfortunately, my reliance on pollo a las brasas blinded me to the rest of what is undoubtedly the South American continent's finest and most diverse cuisine, though I didn’t have the knowledge to appreciate it at the time. 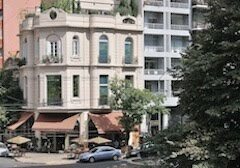 Fortunately, in the intervening years, there’s been a boom in Peruvian gastronomy in both Santiago (think Barandiarán) and Buenos Aires (think the homey Status or the more elaborate Bardot, among many). When I’m home in California, though, my options are limited for a cuisine that I could happily enjoy at least weekly. After four or five months in South America, when I’m back sleeping in own bed, I’m usually tired of eating in restaurants and, when I do go out, I’m rarely close to outstanding restaurants like San Francisco’s La Mar or Half Moon Bay’s La Costanera. 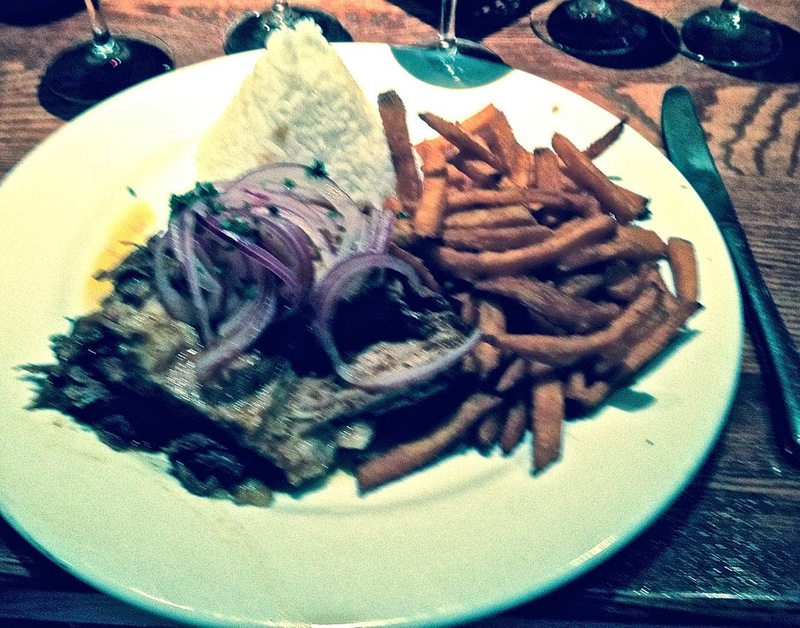 In the East Bay, unfortunately, our Peruvian options are limited and we have to settle for simpler fare. We greatly enjoy the comida criolla at Berkeley’s Arriba Perú, a few blocks from the University of California campus, but they inexplicably do not offer ají de gallina, one of my favorite Peruvian dishes. 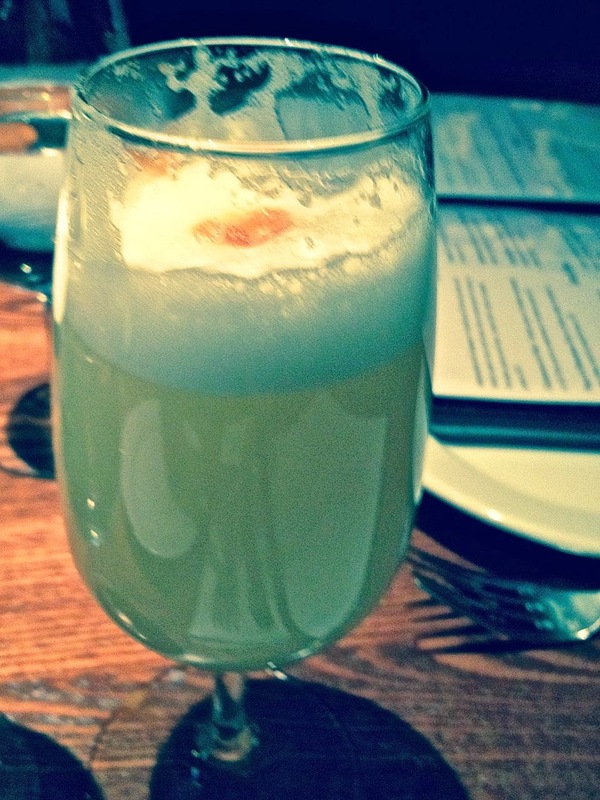 Nor do they have a liquor license, so pisco sours are not an option (though once, when I inquired about it, they served us their limonada especial (“special lemonade”) on the house (presumably evading the letter of the law). 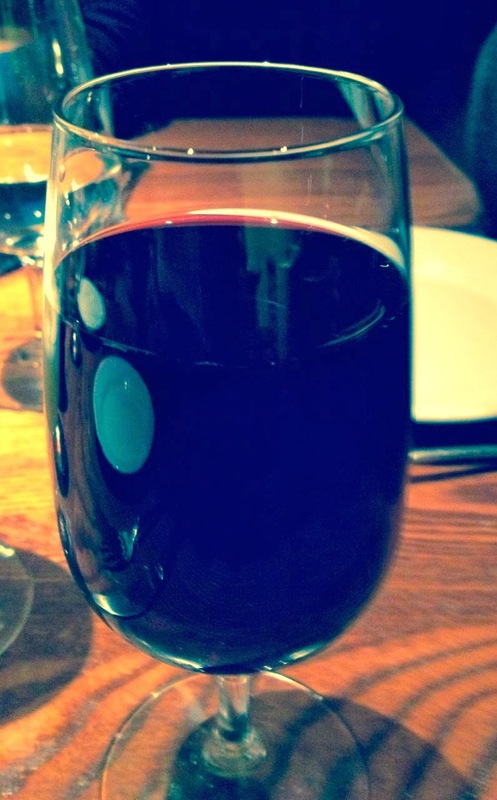 We usually bring a bottle of our own Argentine or Chilean wine to accompany their ceviche and other seafood dishes. Sunday night, though, we ventured with friends to suburban Alameda (no relation to the Avenida del Libertador Bernardo O’Higgins, the alternate name for Santiago’s main boulevard) to dine at Chicha Bistro, a new Peruvian option that’s not much farther away than Arriba Perú. It’s not an elite restaurant, but dishes such as adobo de chancho (marinated pork, with a side of fried sweet potatoes) are abundant and flavorful (I appear to have regained every ounce a 20-mile bicycle ride through the Oakland Hills on Sunday). I passed on the ají de gallina this time because the pork (pictured above) sounded so appealing, and it was indeed flavorful. What tips the scale over Arriba Perú is that Chicha does have a liquor license to serve pisco sours (suitably tart, pictured above) and even Peruvian wine (a deep red Intipalka Tannat, pictured below, that I had no idea was even produced in Peru, as the varietal is almost exclusive to Uruguay). Chicha Bistro easily passes the “Would I go back?” test that I apply to restaurants, though we would have preferred a quieter ambiance. Being authentically Peruvian, Chicha even shows football on a wall-mounted TV – but last night, it was American handegg rather than the soccer I would have expected. I won’t go back very soon, though, because next week I’m flying to Santiago en route to exploring Patagonia for several months.